Resting at the foot of a magical, ‘picture postcard’ hilltop town, with breathtaking views of the countryside and coast, sits Hotel Leone. A beautifully restored, historic town-house, Hotel Leone offers an enchanting combination of elegant accommodation, personal service and delicious, seasonal cuisine. 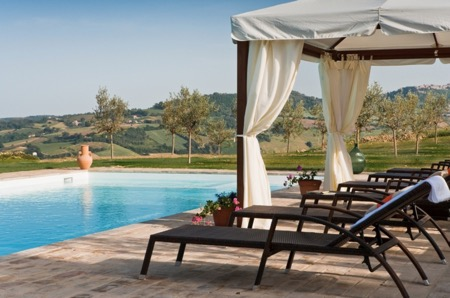 The perfect chic retreat, at Hotel Leone you can simply relax and enjoy the peaceful location between the mountains and the coast, indulge in lazy days by the pool or take gentle journeys around the local medieval towns. For those wishing to delve deeper into the typical Le Marche culture, the hotel’s owners Madeline and Tim Jones have created several inspiring experiences where their guests can enjoy an authentic taste of Le Marche.